This was a big year for the commercial drone industry as a whole. It saw a significant increase in the business adoption, the expansion of the FAA’s LAANC program (the Low Altitude Authorization and Notification Capability that provides access to controlled airspace near airports), the launch of the UAS Integration Pilot Program from the FAA (aka IPP), new products like the Phantom 4 RTK from DJI, and some significant developments for new regulatory frameworks for drones in Europe and in India. 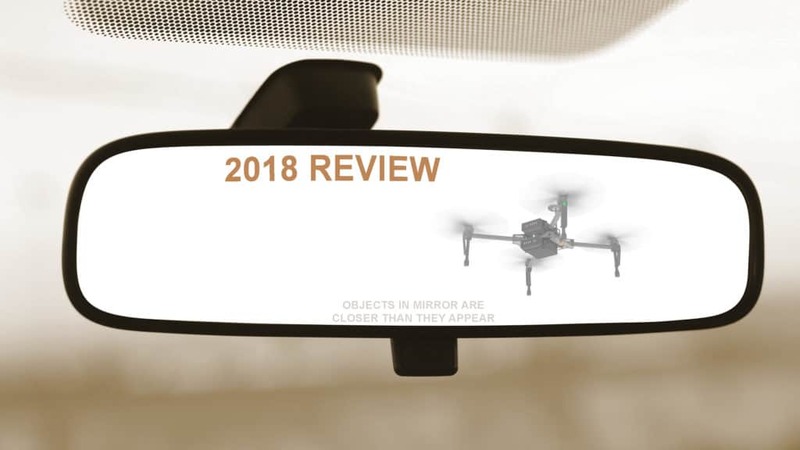 In this post, I’ll illustrate some of the market trends over the past year using data from our third annual drone industry benchmark report and describe what I think shaped the drone industry. Listen to this companion Drone Radio Show podcast here for the complete assessment. In 2018, we saw companies begin to move beyond the provisional use of drones—where they were outsourcing to determine a drone program’s feasibility–to standing up or expanding internal teams to manage workflows and data. You can see this trend, particularly in the U.S. when you realize the growth in the number of certified Part 107 remote pilots. The U.S. began the year with about 74K certified remote pilots, and as of the end of November, we had about 112.5K. So we’ve added about 38,500 pilots this year. That’s a 50% increase over last year. The thing about this increase is that it’s mostly pilots who work for companies, enterprises, or public agencies with internal drone programs. We saw this trend in the data from our annual benchmark survey conducted over the summer. There were some winners and losers this year in the race to gain more customers and satisfy investors. Probably the biggest contraction story was the $118M collapse of Airware. Fortunately, Delair acquired Airware’s software solution, which ensures the continuity of service for existing customers and dealers. The agreement also included keeping the team from construction and mining specialist Redbird, which Airware initially bought in 2016. The other contraction was from Parrot. Earlier in the year, Parrot released its ANAFI work drone for the commercial drone market. But then just last month, Parrot’s CEO announced disappointing financial results because of what he called “a significant consumer drone market contraction.” Suffice it to say they are running on thin cash flow, and it will be interesting to see if there will be a right-sizing of Parrot and its affiliates like senseFly and Pix4D in 2019. Another big move this year was PrecisionHawk’s acquisitions of both HAZON and InspecTools. These businesses specialize in inspection services and technology for the energy sector. They bring PrecisionHawk the domain expertise that will enable tighter integration between collecting and analyzing drone data—something customers want. We think these acquisitions position PrecisionHawk as a leading service provider for companies wanting to perform asset inspections—specifically those companies in the oil & gas, insurance, and utility industries that need beyond visual line of sight (BVLOS) operations. If you recall, PrecisionHawk was part of the FAA’s Pathfinder Program, so they have extensive experience in BVLOS ops. You can’t talk about the drone industry without mentioning market leader DJI. The company continues to dominate the market and has made gains this year in every category, from drone aircraft at all price ranges, to add-on payloads, to software. Our survey data shows DJI is still the dominant brand for drone aircraft purchases, with a 74% global market share in sales across all price points. DJI’s current global market share is two percentage points higher than it was last year (72%), and is a significant change from 2016, which showed them with 50% market share. On that note, many industry and UAS news pundits speculated that security concerns about DJI small drone aircraft would be the death knell for DJI (a China-based company), but clearly these fears did not affect their sales. To stem concerns about DJI’s data security practices, the company hired a forensic investigation company, Kivu Consulting, Inc., to independently review DJI’s UAV data transmission and storage practices. Kivu’s analysis of the drones and the flight control system (drone, hardware controller, GO 4 mobile app) concluded that users have control over the types of data DJI drones collect, store, and transmit. As I’ve have noted in our report, much of DJI’s dominance can be attributed to its aggressive product development, technological advancements, and partner development in the enterprise channel. DJI’s leadership role existed as early as 2015, when we looked at FAA data on commercial drone registrations. The company continues to release new product after new product, and it leads other manufacturers with technology and enterprise ecosystem partnerships. We predicted last year that this would continue well into the future, given their current lead, their strategic partnership investment with Hasselblad, their recent investment in an R&D facility in Palo Alto, California, and the continuation of their AirWorks Conference enterprise partner ecosystem event. That’s it for now. Look for a follow-up piece on our specific predictions for 2019, which will include investments, technology improvements, ecosystem partnerships, and software innovations. If you have questions about what’s in the report I mention or would like to comment, write me at colin@droneanalyst.com. Previous Previous post: What Hurdles Will Amazon Prime Air Need to Overcome?